I laughed myself silly at this. 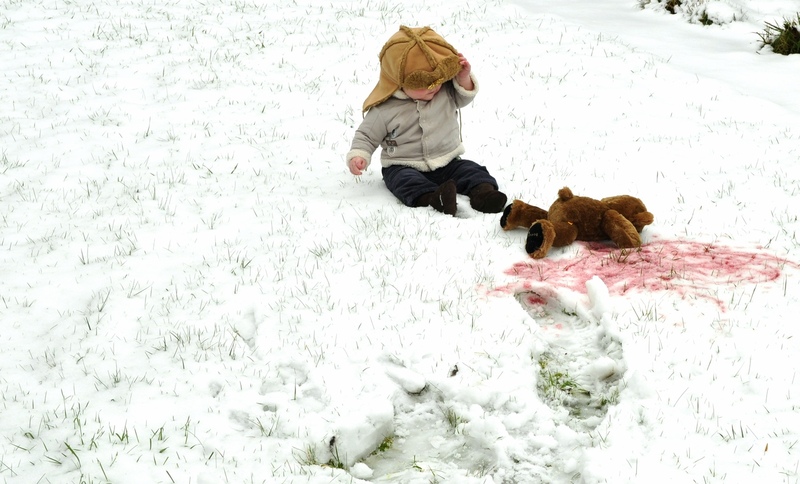 Arthur’s thinking: “Why did mom put all the raspberry jam on the snow?”. Sorry to hear it’s colder than North Dakota in England right. Bundle up, little man. We need to keep our favorite actor healthy. Welcome back, Arthur! We’ve missed you, little man! HAHAHA Cynthia’s so right! Seems like he’s wondering what’s going on! Welcome back! Nice choice! Don’t wait so long to update, the public wants more! I love the Arthur’s scenes!!!! This ideia is the best! This is amaaaaaaaaaaaazing! Don’t stop it! We are having fun and loving how unbelievably cute he is. And Arthur will treasure this pics forever. Arthur should do a scene from Star Wars or maybe the stuffed animal scene from ET.